In the late 13th or early 14th century a new phenomena appeared around the Mediterranean Sea, the Portolan Chart. The Portolano or list of sailing directions had been known for centuries, with two of the oldest being “The Periplus of the Erythrean Sea”, 1st C AD and the maritime section of the “Itinerarium Antonini,” 3rd C AD. These are just lists of ports, distances, obstacles etc. But later 12th century lists encompassed the whole Mediterranean with distances and wind directions. Then, those lists were transferred to a map; not just any map but one which portrayed wind directions via a “Windrose”. Then magnetic declination was discovered by the invention of the magnetic compass and thus its disagreement with true or geographic north. When this information was added to the map, the Portolan Chart was born. The earliest extant example dates to c1311. But the magnetic and geographic differences were thought to be mis-understood, which can be shown to be fallacious, as the charts themselves prove. "There is little uncertainty, for instance, about the materials used and the techniques of execution. 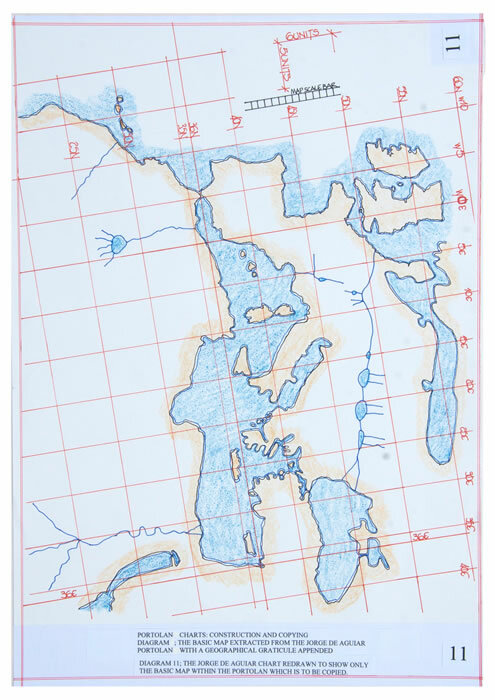 Nautical charts were hand-drawn on sheep vellum. The larger ones took up an entire pelt, preserving all of its characteristics and dimensions, i.e., a rectangular shape longer on one end (corresponding to the animal’s neck), where it forms the so-called linguetta [small tongue] or umbilicus; the opposite end was generally attached to a stick around which it was rolled (this explains the tears now visible, caused by forcible attempts to detach it). Of course smaller charts, depicting less extensive areas of sea and land, have other shapes (though still generally rectangular). These were mounted on wooden tablets or cardboard and met a different fate as far as preservation is concerned. It is not the intention of this paper to fully detail the manufacture of the above materials. There are an adequate number of books and on-line texts available. This text analyses the medieval text mentioned, discusses others and offers an insight into the reality of producing a Portolan. It is based upon firsthand experience of the materials, not conjecture. Ramon Pujades i Bataller has concluded that the origin of the Portolan chart was a region of NW Italy, the Gulf of Genoa and the Ligurian Sea [diagram ChPo3D1]. Thus animals available to produce the base material would be local cattle, sheep and goats with wild animals, deer, hares and rabbits. Some would have been farmed both by the lay people and monastic communities, and thus we can reason why there was treatment required to the skin surface to enable its usage. The local cattle are the Chianina, which were principally a draught breed and one of the oldest cattle breeds. They are white in colour, their hair coat; the skin is actually black. Hence any drawing or writing material made from this hide would certainly require a white surface to be introduced before it could be used. The goat is perhaps the more likely animal to be used, but they are not all white skinned and thus any vellum, which is not normally translucent, would exhibit the same colouration as the natural goat, that is, where the coat is coloured the skin would be the same colour. Parchment produced from sheepskin is normally white and prevalent; it is a good herd animal, bred well and lambskin is par excellent. But for texts, hare and rabbit are quite usable, and as mentioned deerskin. This was certainly so in Spain where the meat of cows/bulls was rarely eaten in the Middle Ages and as charts were produced in Majorca it is worth noting that the cattle breed is the Menorquina/Mahonesa, which is light brown in colour. The mention of tanning raises one further problem as once a skin is tanned it is technically Leather. The tanning process ‘locks’ the fibres of the skin in place and they can never be released. Vellum is not tanned which is why it needs to be kept in a dry-ish atmosphere. The process describing boiling down the off-cuts is used to produce ‘Kelmscott’ vellum, which is a dirty, smelly process but the results are stunning. This is the material highly prized by botanical artists. The fact that the text refers to protection from humidity may be indicative of ‘vellum’ products as opposed to leather which could be soaked for a long while, not much would happen to it, although depending on the ink dye source, the ink may not survive. Thus we can be reasonably certain that both leather and vellum in one of two states was used. However, once a hide is prepared and coated with any medium it loses translucence/transparency and is in effect a dense surface as leather. Thus knowledge of the gradual introduction of vellum or parchment from a basic hide to a fine translucent material is required. If we do not understand the base material of the 13th century, the method of production and copying of the maps and charts cannot be discussed. It has been shown from the texts of ‘Herodotus’ and ‘Pliny the Elder’ that parchment was known in ancient times. Herodotus states, “The Ionians also call paper ‘skins’- a survival from antiquity when paper was hard to get and they did naturally use goat and sheep skins to write on. Indeed, even today many foreign peoples use this material.” But, parchment dating to 196-189BCE from the Roman Fortress of Dura shows that Pliny could also write definitively on the subject; see ‘Natural History’, Book XIII, chapters 21-24. By the 3rd century, parchment was the preferred writing medium, and importantly both sides were written on and thus the opacity/translucence/transparence can be seen to be very limited and unnecessary. It was after all mostly the result of a tanning process. But tanned leather, however finely scraped was, as has been stated, a locked pelt and a much finer material was sought. This came about when the tannin was removed from the baths and the material changed its basic properties. There are two texts available to illustrate the change in the process; the first dated to the 8th century and the second the 12th century. Thus it is reasonable to opine that when the first maps or charts were drawn emanating from the Ligurian Sea zone, which includes Lucca, both forms of material were used as leather is much cheaper than parchment and a known material. Thus it is also fair to state that if the translucent/transparent quality of the vellum was not required, then the extra cost involved by refining the pelt would not occur. There is however still the problem of surface treatment, which is carried out on the flesh side of the vellum to produce a smooth silky nap to which inks will adhere. A variety of treatments, pumice powder and thin pastes were used to create a smooth hard even white surface, which would have affected the translucency of the base material. Thus we must consider that the maps or charts were actually drawn on non translucent leather or vellum. “To make parchment as though it were glass take a thin parchment preferably from a kid slain which is already reasonably transparent. If you can find such a parchment scrape it with a knife as thinly as possible. Then soak the scraped parchment in the whites of eggs which have been allowed to go rotten, or in a watery solution of gum Arabic in a fish glue which has been diluted with water or in a glue made by filtering through a cloth or a glue made from the shavings of this or any other parchment. Then, when the parchment has been softened in one of the above ways, stretch it on a frame as you stretch parchments normally after taking the pelt from the lime bath. When the parchment is dry it is ready. But when it seems after drying that it had insufficient of the liquor, take a sponge moistened with the latter and smear the parchment on both sides until you think it is all right. And then if you place the parchment over any picture the latter is clearly visible through it and you can draw upon the parchment a true likeness of the picture you wish to copy.”(Reed,1975, p85). In the photograph [diagram ChPo3D2] there are examples of various shades of colour that are within the vellum from a black/white; brown/white; golden and finally a white animal. There is also a sample of sheepskin parchment and a fragment of transparent vellum which has under it a photo of a Chianina cow. They are set on a paper printed chart with natural light used as the method to illustrate translucency for enhancement. However, it should be noted that if the base material was transparent it would be quite useless for a chart with any background always showing through onto the map etc. When a Portolan chart is studied the overall impression is that of a geographical profile for the Mediterranean basin and Black Sea area. They are of course slightly skewed to the north the further east the map extends, and this probably emanates from the introduction of the magnetic compass and its deviation against true or geographical north. 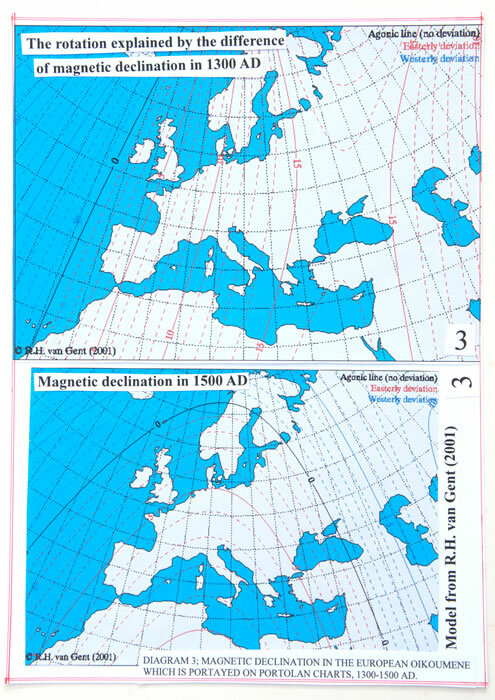 From the Iberian Peninsula in the west to the Black Sea in the east there is a gradual deviation of magnetic north from 00 to c110 west of north [diagram ChPo3D3]. Thus when studying a Portolan such as that of Angelino Dulcert it is possible to divide the chart into three sections each with a variation to true north [diagram ChPo3D4]. 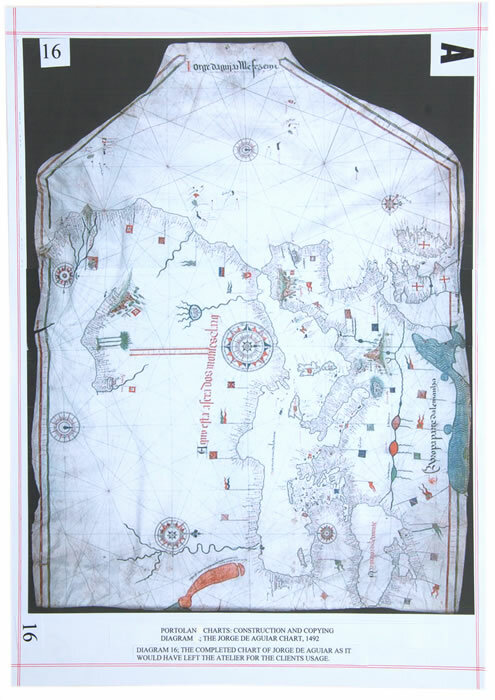 But, from whence came the original geographical maps from which the Portolan chart evolved. Historically there are a series of major events in geography/cartography beginning with the world map attributed to Marcus Vipsanius Agrippa (66-12BCE) as described by Pliny the Elder (23-79AD) in his Natural History. Therein he details the distance measures of the various Roman Provinces, and information on Latitudes. Pliny was preceded by Strabo of Amaseia (64BCE-25AD) who took the three books of Eratosthenes’ of Cyrene (c285-194BCE) and redrafted them into a general history/geography/humanist text. But from Strabo it is possible to draw a map of the oikoumene extending from Iberia to India as it would have been known in the 3rd century BCE updated to the 1st century BCE. Following on we have the ‘Geography of Pomponius Mela’ (c50AD) whose text was being used as late as the15th century by Pirrus de Noha on his mappa mundi, which he combined with the work of Claudius Ptolemy to produce his map. Next, are possibly the two most important cartographic texts ever written, those of Marinus the Tyrian (c100AD) and Claudius Ptolemy (c150AD). The latter took the formers work and produced a ‘Geography’ which included over 8000 places determined by Latitude and Longitude. Even today we can use these co-ordinates to draw a map of the perceived 2nd century oikoumene. By the 4th century AD there was a seed change in cartographic/geographic research. The ‘Church’, monks and clerics, are interested in the subject and as monasteries became prevalent with their scriptoria producing ever more copies of ancient texts as the centuries unfold, this knowledge is transmitted across the ‘Christian’ world. In the 5th Century Paulus Orosius wrote ‘Historiarum adversus Paganos libri septem’ (c418AD) and devoted the first book of this text to a geographic treatise of the oikoumene. In the 7th century, The Venerable Bede wrote in two of his books geographical information and included the following, that a ‘manuscript of the Cosmographers’; ‘Cosmographiorum codici mirandi operis’, a book procured by Benedict Biscop (founder of the monastery at Jarrow, England), obtained in Rome was subsequently exchanged for 8 hides of land. In the period AD814-825, Dicuil, an Irish monk who was at the court of Charlemagne wrote ‘De Mensura Orbis Terrae’, utilizing the foregoing texts and many more. Thus the monastic community was no stranger to the geography of the oikoumene. But more importantly the world was being described yet again in Ptolemaic terms. That is tables of latitudes were being prepared, which would enable cartographers to align from south to north the various places they intended to set upon the map or chart. But one set of tables, known as the ‘Marseille Tables’ gave both latitudinal and longitudinal co-ordinates for 32 places in the oikoumene. These tables were a great improvement upon the Ptolemaic table as they corrected the over-length of the Mediterranean Sea. “First let us turn to the question of methods. It has always been a relatively easy matter to find latitudes, for even without instruments by no means a false idea of our position on the earth’s surface in relation to the poles and to the equator may be obtained merely by observing the course of the sun or stars. Geographical latitude is so patently correlated with the appearance of the heavens, that the relationship was noted at a very early date. Ancient geographers were skilled in finding latitudes by using a simple instrument resembling a sun dial, and Eratosthenes’ calculation of the circumference of the earth was made possible by knowledge of the difference between the latitudes of two points in Egypt found by this means. The Moslems perfected the Astrolabe, an instrument that came into universal use during the Middle Ages, and in 12th century Latin translations of Arabic works we find rules telling how to find latitude using an Astrolabe. Therefore, at the beginning of the 12th century the geographical and cartographical knowledge had expanded exponentially and it only required a person or persons to collate the data. But, that was always going to be, in the Christian west, a cleric or monk who had the education to read and absorb the data and the time/materials to produce the article. It was normal for the children of nobility to be trained and educated, second sons quite often becoming clerics, but in Sicily there were circumstances which led to the second son becoming King and his education being put to good use. Thus, perhaps the next climactic in terms of cartography and geography in the western world occurred under the auspices of King Roger II of Sicily (and Naples etc), when Al-Idrisi wrote his geographical treatise, produced not only a silver planisphere, but also an atlas of 70 maps [diagram ChPo3D5] which covered the known oikoumene. This was in 1154AD. But, in 1130AD King Roger II, ordered that ‘Saint John of Hermits’, an Orthodox monastery in Palermo be rebuilt in Norman-Arab style as a Benedictine Abbey, completed in 1148AD. Monastic establishments were prevalent throughout Europe; the Normans established and supported many and thus had an information highway stretching from Britannia through Normandy to Southern Italy and Sicily. King Roger II maintained a fleet of both trading and warships and was active particularly in the eastern Mediterranean. 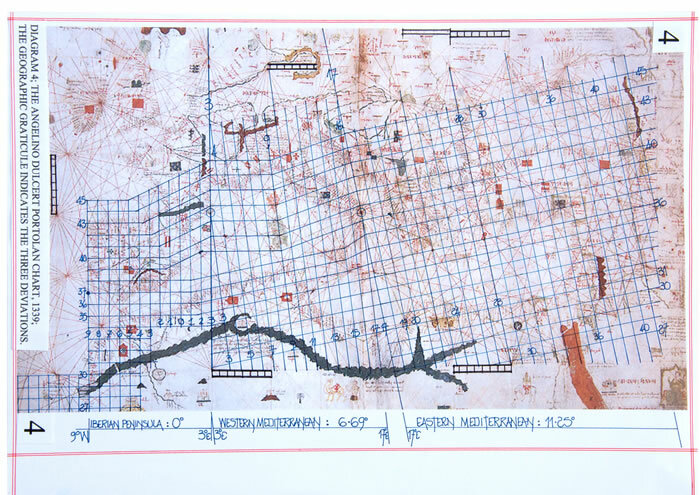 He also collected a large corpus of geographical information which when Al-Idrisi arrived was to form part of the data used by the drawing team for the maps. That an information highway existed is shown by the fact that Al-Idrisi could write about the Norman English coastline from Lands End to the River Tyne giving the river names and Norman Castle sites there-on. (website texts, cgId/1, /2, /3 and cgId/4 fully detail these facts). In terms of geographical records Al-Idrisi clearly states what was used in the preparation of the maps and text, including a copy of the ‘Geography’ of Claudius Ptolemy. And here we should remember that this area and southern Italy were previously part of the Byzantine Empire, with a Greek Orthodox community as well as an Arab community from their occupation periods. Thus we do not know if the copy of the ‘Geography’ of Claudius Ptolemy was a Greek or Arabic version. But, with such diverse peoples in Sicily it would be surprising if it were not known to all parties. We can be certain however that this collection of geographical texts was probably one of the finest. Thus, is this a first copy of Ptolemy in the west, and just how was it disseminated? Then with the monastic community in Sicily connected to that of Italy and the land route from Normandy to Sicily being via the Ligurian coast there is the distinct possibility that the geographical knowledge, copied in the scriptoria of monasteries, was thus transferred to the Genoese area. In Sicily with data available from Al-Idrisi, that collected by the Fleet of King Roger II, and a greatly enhanced geographical awareness it is quite possible for a geographical map of the Mediterranean Sea and the Black Sea area to have been developed in the period 1154-1254AD. Thus it was ready for the emergence of the magnetic compass with its ramifications for the maps and charts which followed. 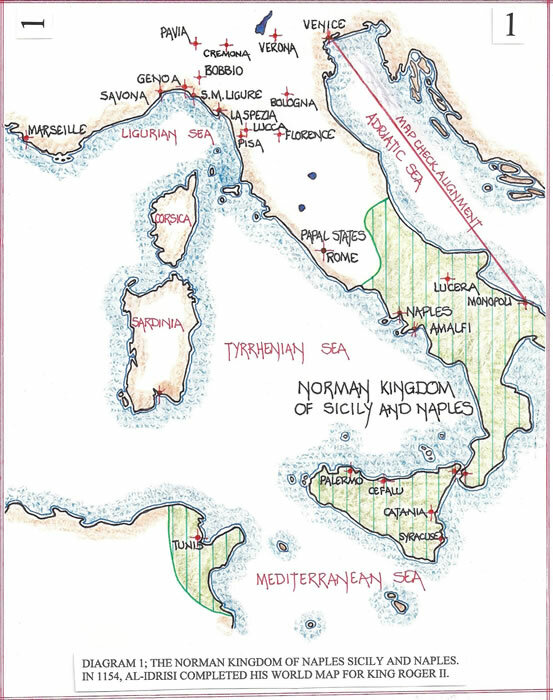 The Norman Kingdom of Sicily and Naples encompassed southern Italy and included the western seaboard town of Amalfi. Here in 1269AD, Petrus Peregrinus wrote a treatise on the magnetic compass, entitled, “Epistola Petri Peregrini de Maricourt ad Sygerum de Foucaucourt, militen de magnete”, (known as Epistola de magnete). In fact his treatise is dated as 8 August 1269 and it is written during the siege of Lucera in southern Italy when he was part of the army of Charles of Anjou, King of Sicily. Petrus Peregrinus describes two types of compass, one suitable for use on land and one using a magnetized needle suspended in a cylindrical case with a transparent cover, similar to today’s modern hand compass. Commencing in 1154AD with Al-Idrisi and the documentation collected by King Roger II, through the next 100 years the monastic orders expand and as is their want copy numerous texts for trade purposes. The Benedictine houses appear to be prevalent. In 1098 Roger 1st, as Great Count of Sicily was appointed Papal Apostolic Legate with the rights to approve the islands catholic bishops; thus it is a simple step to opine that the Kings of Sicily knew what was happening in the scriptoria of their monasteries, and, what and how many maps were produced particularly for their own fleets. Add to this the treatise on the magnetic compass written under the auspices of Sicily and Naples and we can see a simple link to the whole idea of the Portolan chart coming together in this southern Italian kingdom. Is it any surprise therefore that the monasteries [and they are mostly Benedictine] of the same western coastline of Italy, those of the Ligurian Sea area are actually thought to be the originators of Portolan charts? The earliest extant Portolan charts are dated to 1311/1325, [attributed to Pietro Vesconte and Angelino Dulcert] and the magnetic compass was known in c1269, and thus there was time for a geographical map of the Mediterranean Sea to be amended to reflect the knowledge of magnetic deviation. 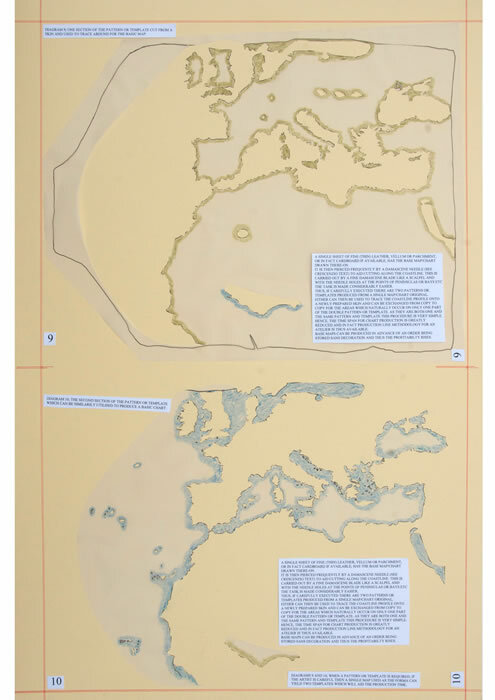 The accuracy of both the Al-Idrisi world map (the 70 co-joined) and the earliest Portolan charts can be assessed by aligning them to a Mercator projection map as on diagram ChPo3D6. However, charts and world maps of the 14th to 16th centuries are flat earth maps having no projection as such. Some are drawn with a variation between the latitudinal and longitudinal degree measurement, but on many the scale is so small that inaccuracies in draughtsmanship of the maps (see Genoese 1457) precludes definitive statements. But, in theory, they should all have a ratio of 5:4 between latitude and longitudinal measurement. That is the natural difference of the two at 36N whether it is a geographical map or a Ptolemaic construct. But, from the original Al-Idrisi plot to the Portolan chart the difference is marked; the intervening century was well used to regularize the map. 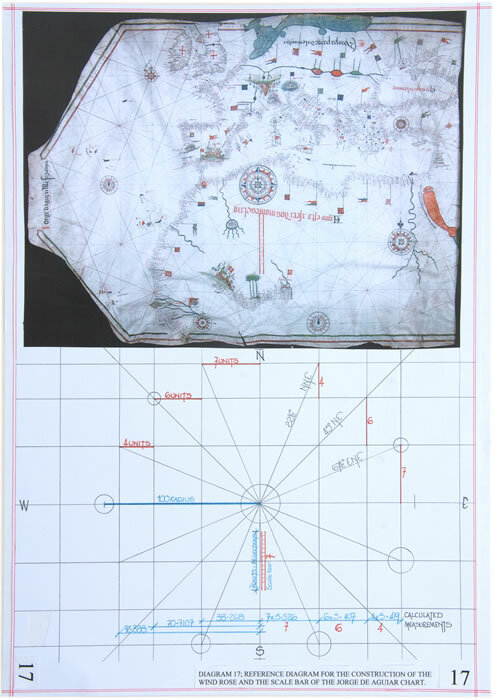 Thus it is necessary to evaluate what the first Portolan chart may have looked like [diagram ChPo3D7]. If we accept that they emerged finally from the Ligurian Sea area and were developed by the monastic establishments prior to ateliers being formed, [before the general or seagoing populace was aware of the genre], we can be reasonably certain that they would have been well adorned by the monastic scribes. Monasteries do not do plain and simple, they do sumptuous colours. Look at the genre of monastic world maps, the mappae mundi such as Hereford, Cornwall, Ebstorf and Fra Mauro, and the historical Christian geographic texts which are all adorned with sumptuous colour and Christian iconography. The scriptoria of monasteries did not do plain, nil adornment, nil colour, they took immense pride in their work, so much so that it became a currency to be traded in order to obtain more and greater textual information and even land: libraries were knowledge and de rigueur. Thus in all probability the extant Portolan charts, highly coloured and decorated are the correct descendents of the original Portolan charts developed in the monasteries and the plain navigators chart,[of which there is great doubt concerning its form and usage], was a simple follow up for general use, possibly at sea. Introduce the Windrose across the face of the simple chart, colour code the winds as per the monastic charts and then add the magnetic bent of the Mediterranean Sea etc and we see the possibility of the mariners chart evolving. “Martin Cortes de Albacar’s “Breve compendio de la esfera y del arte de navegar”, written in 1545 and published in Seville 1551, became very well known internationally because it went through 9 editions in England, the last of which dates to 1630. Many authors have seized upon the precise instructions the text gives to explain how nautical charts were made, since the entire second chapter, “de la composician de la carta maera” is exclusively devoted to the subject. If we summarize the steps he describes the order is as follows; 1) take a piece of vellum or paper of the required dimensions and, using black ink, draw two perpendicular lines, one horizontal (E-W) and the other vertical (N-S), which intersect in the middle of the vellum or paper. 2) draw a ‘hidden’ circle big enough to take in almost the entire chart, the centre of which must be the point of intersection obtained in the previous step (he specifies that some do this with a stick of lead, the marks of which are easy to erase). 3) trace out the network of rhumbs by successively dividing the four initial arcs in half time after time until a total of 32 winds are obtained, of which the 8 main ones must be in black ink, the half winds in green ink and the quarters in red ink. 4) draw the parallels to these 32 lines, which must not pass through the centre of the system, each one in its corresponding colour. 5) extend the lines from each of the points of intersection with the ‘hidden’ circle in order to obtain a further 16 roses, an operation that may be repeated to obtain 16 more inserted among the previous ones (if the chart is very big). 6) trace the required littoral pattern (an operation he describes as ‘trasflorar’) onto pieces of special paper (thin and transparent after having been soaked in linseed oil and allowed to dry in the sun) attached to the original with wax or held down by weights, and copy also N-S and E-W rhumbs, which will later serve as a guide when it comes to fitting the pieces together. 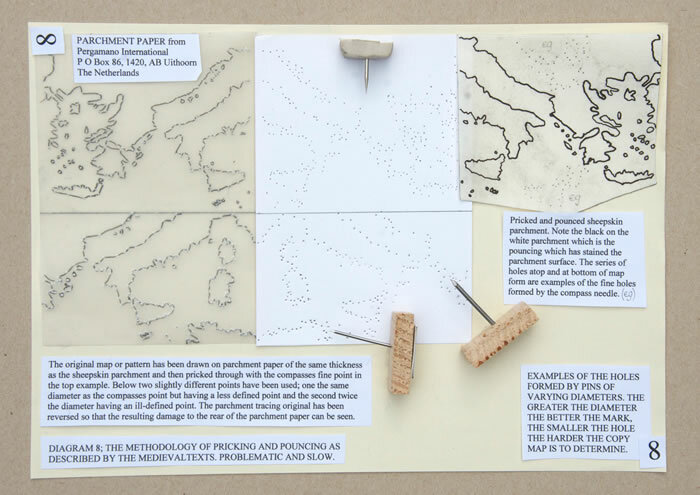 7) take a piece of paper thoroughly smoked on one side and place it between the tracing paper featuring the coastline and the vellum or paper onto which the chart is to be copied, on which the wind network has already been drawn, and with a round-pointed punch run over the coastline so that the smoke marks it on the vellum or paper. 8) run over the smoke line with black ink and, once the ink has dried, rub out the smoke using bread with the crust removed. 9) next write the toponyms, first the red ones and then all the rest in black ink. 10) add the ornamental motifs. 11) draw the graphic scales. 12) graduate the chart in terms of latitude. Corradino Astengo makes the following comments on the subject in addition to those above. “In his chapter ‘De la composicion de la carta de marear’ Martin Cortes suggests that first all the wind rhumbs, both main and secondary, be traced in, and then transparent paper and ‘carbon paper’ be used to copy the coastlines from a ‘padron’ (master copy); he also mentions that one can divide the original into a number of little squares if one needs to enlarge or reduce the image. Bartolomeo Crescenzio mentioned two other methods for copying from an original: the first would have involved stretching both parchments on a frame that was then held against a light source to make tracing possible; the second, known as’ pouncing’ involved the perforation of the coast line with ‘thin needles’, leaving a trace of pinpricks on the new parchment that could be dusted with soot in order to give a clear black outline to be reworked in pen. The scholar criticizes these two methods as the source of imprecision and error”. End. So began Professor J A Gaspar in his 2008 paper regarding Portolan charts and in particular two charts those of Jorge de Aguiar (diagram ChPo3D7) and Angelino Dulcert (diagram ChPo3D4). His summation is quite daunting, but it can be argued that researchers have not redrawn charts from first principles using the information contained there-on to reconstruct that which is portrayed. Texts and computers have been used, but not a forensic examination of a Portolan by redrawing. This research does that and illustrates not only the simple methodology involved but also the method whereby the map was superimposed askew upon the wind rose diagram. The method of copying by pricking and pouncing using a fine point to puncture through the original onto the new vellum underneath, and then lamp black or soot set onto a very fine cloth being wiped over the surface, is problematic. Firstly, the pricked hole has to be capable of being seen; that is, it has to have a proper indent into the new vellum such that a spot of lamp black will fill the hole as a permanent mark [diagram ChPo3D8]. Secondly the number of holes required will vary with the complexity of the coastal features being copied. Thus islands with a varied coastline and the Peloponnese would require more than several holes, some very close to each other to form the actual profile. The small example drawn required 280 holes! Of course if the holes were of a general nature and the cartographer just drew the profile by visual copying or from memory it is a different scenario. Quite a possibility! But the dots require joining via an ink line. Therefore unless the ink was as black as the lamp black used to fill the holes, the pricked holes would show as dots along the line. Then the problem of the quill picking up the lamp black as it overdrew the dots and thus the line is thickened or the ink blobbed, and did not flow, would be another problem to overcome. This should be quite easy to see on a Portolan with the naked eye, but most certainly with a magnifying glass. As the hole is permanent and filled with lamp black and ink residue it would also be very hard to erase by scraping if an error occurred. It is also strange that the singular drawing tool, charcoal, has not been mentioned once in the extant texts. This is quite bizarre as it is and has been the major drawing medium for eons. ” many could best be answered by practical experimentation, or by high resolution Portolan scans if those could be compared side-by-side on a computer screen via enlarged downloaded details”. I disagree and have chosen to answer the questions in a form that illustrates the research here-in and explains my objections. 1) How was the information conveyed from one table-sized chart to another? Answer; draw the graticule on each to the same scale and use a template. 2) Was a special desk needed? Might there have been customized tables with slots in so that the relevant portion of the model could be brought to the copyist, particularly when entering the names? Or for charts, which would always be rolled inwards, might this have allowed work to continue on a succession of vertical bands? The techniques used for copying books would hardly have been adequate and the 1318 Vesconte illustration (HOC plate 31) probably shows an atlas sheet. Alternatively, would the vellum have had to be tightly stretched so as to present a perfectly flat surface, e.g. for drawing the rhumb lines? Answer; yes, the vellum must be stretched to the drafting board probably by stitching the ‘legs’ together at the back of the board. A flat surface would be a necessity. The text was plain copied after the chart was completed. 3) How were models at different scales produced, (assuming that the practioners could not, or did not, directly copy at a different scale)? 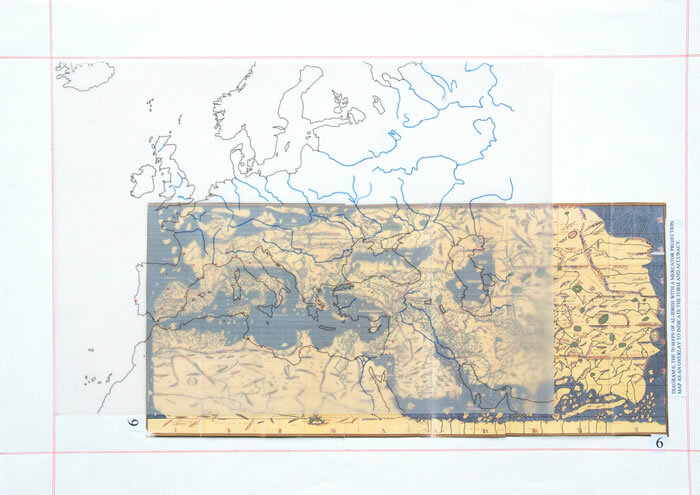 Answer; simply place a grid formed by thin threads onto the face of the map and on another vellum draw the grid to the enlarged or reduced scale, then copy off the points where the map crosses the grid lines and scale the intermediates if the grid is not tight enough. Simplicity! 4) Exactly how were coastal outlines transferred from the model to new work in the 14th century and what traces can be seen of that (or those) process(es)? Answer; with a template laid on the basic forma of the wind rose. There would then be no trace of the work except the pin holes to hold the template in place (as has been noted). 5) If pouncing was used, presumably transferring only significant points along the coastline that would mean the intervening sections were added freehand. This has been found to be the case with some chart-makers. Will close comparison of a wide range of charts confirm that that was the general rules, at least before the 16th century? Answer; if a template was used then pouncing could be a method of transferring the coastline to the vellum. It would be far more practical to draw around the cut out profile of the template with a charcoal stick and then over-draw with ink. Thus if the coastline is a Sepia ink, which is not dark enough to cover the black pounce spots, it would not notice. Thus the littoral could be simple or enhanced. Diagram ChPo3D8 is a photograph of the pricking and pouncing of part of a map. This small section took 280 holes as the photo indicates, and they were nearly impossible to follow when it was necessary to draw the coastline from them. 6) What did or did not form part of a coastline model, e.g. which of the islands were traced and which drawn freehand? And was that distinction the same for all chart-makers? Answer; in all probability the smaller islands were just transferred in position by dots through the template, which is so very easy to do. 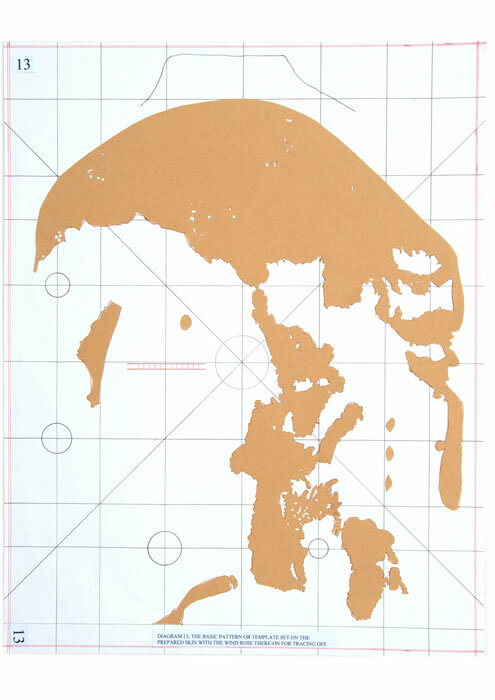 It is the scale of the map which will determine this and thus the size of the cut-out template for the island. 7) If it proved possible to identify the unique characteristics or signature of a single pattern (perhaps indirectly via cartometric comparison of the placement of a charts nodal points, usually headlands) could successive patterns used by one chart-maker be identified? Answer; undoubtedly as the templates would all be slightly different. 8) The 15th-century Benedetto Cotrugli described placing a ruler across a chart, between three specified pairs of places. If no islands intervened the chart was ‘right’; otherwise it was wrong (Falchetta, 2008, p271). Might this be a way to distinguish different patterns, or even different ‘schools’? Answer; doubtful as the test is surely just to indicate that the copyist has not misplaced the island which with so many lines could be a hazard. It indicates singular copying for islands and is probably an ingenuous methodology as the lines are false to the winds mentioned. Also he qualifies the idea by saying it may not work all of the time. This is 300 years too late. 9) Could cartometric analysis, focusing perhaps on enlarged sections, resolve the points above? Answer; until cartometric analysis can counter the basic errors and distortions on maps made by the cartographers in drafting, surely we have no method to establish exactness. This is a false idea as it promotes the graph model of co-ordinates which produces curved lines, which never appear on a Portolan, and there are insufficient co-ordinates on a Portolan to allow an accurate comparison. 10) Is it possible to confirm the existence of separate, probably sectioned, toponymic models? 11) If two or more people were working on a chart (sharing the writing, or dividing writing and painting) could they have worked simultaneously (to speed production) and, if so, how did they physically manage (see (2) above)? Answer; it is likely that the system of production is one of the base vellum being lined out by one person, a second tracing the template, a third scribe, and then the final lines and decoration. This could be two or more people, but surely the question can only be answered if we can establish how large an atelier was, was it family only, several people, or did it employ many artisans? If it was a monastery, the answer is, as many as you desire! But a simple template as described could be used to enhance the timescale of production. 12) Is it possible to distinguish between the work of someone who had served a chart-making apprenticeship and somebody who was just given a chart to copy, can those differences be codified? Answer; yes, but only briefly as if you are a good copyist, (think of all of the engravers who have never drawn a chart as a qualified apprentice, and produce the most excellent items) then the final product, which is generally well adorned, would be hard to spot as master or copyist. A cartographer had before him vellum which was to be the basis of the Portolan. If we consider the size of the vellum available from each animal, Calf, Goat, Sheep, it has a natural size. Thus the scale of the Portolan is not primarily determined by mathematics but from what will fit to the standard pelt. Therefore, with many Portolans’ having the same size pelt, the scales are nearly identical and need not be considered as requiring research. Was there a pattern; a basic map of Europe [diagram ChPo3D9&D10] which could be set on the wind rose to the magnetic angle desired by using the graticule, and then the profile simply drawn around as one would use a template? Cut out from strong vellum either in a positive or negative forma, it could be drawn onto the wind rose. Thus there would be no trace of its construction, the lines required to draw an accurate map. Did each atelier have its own template or set of templates for differing scales? 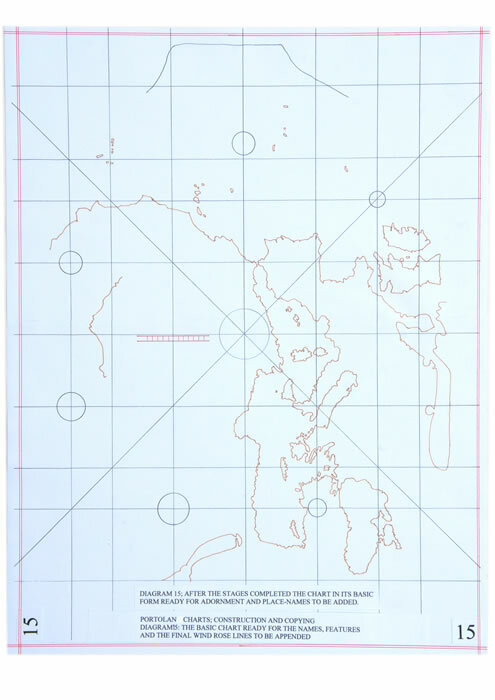 If so then the drafting of copy maps would have been very easy, and even the few pin holes observed may have been an additional aid prior to all of the wind rose lines being drawn, but are more likely to be the result of fixing the template onto the charts surface to allow the profile to be traced. Is this the meaning of the information supplied by Ramon J Pujades i Bataller where a post-mortem inventory, that of Vicenc Pruners’s son, Joan, ‘artifex cartarum navigandi sive menestral de cartes de navegar’, who was said to have inherited ‘ half the patterns for making portolano charts’ from his father; and that the other half went to the sister. “These two documents show clearly, in my opinion, the importance of patterns in the manufacturing process of portolano charts, being carefully divided among the chart maker’s heirs”. But, did they in fact require many differing scale templates? Are there that many different sizes and thus scales used by a single atelier? This would have been unnecessary! Regardless of the final appearance of a Portolan, one definitive map is required to enable it to be drawn, that of the littoral of the area to be portrayed. The coastline of the intended area to be charted with its cities, towns, ports and other places to be named there-on must be available and complete. The wind rose lines are in fact subordinate to the littoral. Illustrated is the basic map required to draw the Jorge de Aguiar Portolan [diagram ChPo3D7]. It is drawn as a flat earth map, with the addition of the longitudinal and latitudinal lines. These are in a simple ratio of 6 to 5 units or 5 to 4 units and represent the 600 and 500 stadia measures of the world. This was confirmed through analysis. The defining accuracy of the map is shown by the longitudes, W0E to 36E which locate the Pillars, Sardinia, Sicily and Britannia correctly and the latitudes set out from 36N which are equally correct. Why would such an accurate map be drawn askew to north as the plot indicates? It should be noted that on the original Portolan, the Red Sea and Baltic Sea are probably later additions, although they have been included in this exercise. 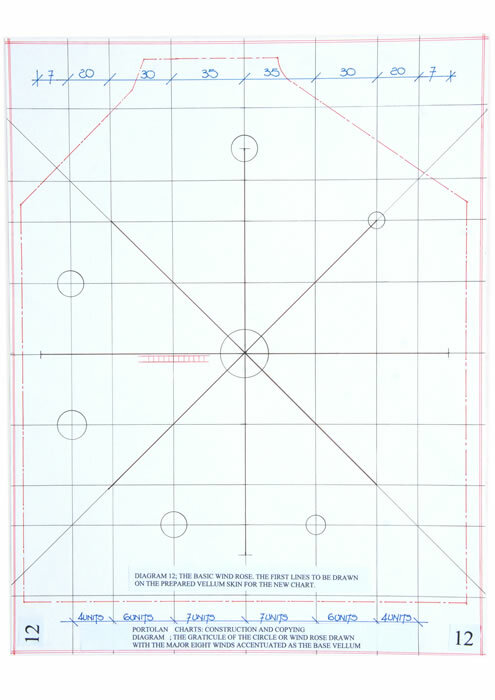 The basic wind rose design is produced by simple measurement from two centre lines. Starting at the centre point distances of 35/30/20/7 units or for a short graticule 7/6/4 units, are marked and the lines extended across the whole vellum. Diagonals are then appended, joining the cross points and thus the lines for the eight major winds, N, NE, E, SE, S, SW, W, and NW are indicated. The scale bar has been appended in its correct position. It is the length of the 7 unit square division and has in fact 14 subdivisions, although they were not all originally drawn. The wind rose sub-circles have been appended now as they interfere with the map text as is seen later and must have been at least ghost drawn to ensure adequate space for the lettering. The template, diagram ChPo3D9&D10, is now placed upon the prepared vellum with the basic wind rose as diagram ChPo3D12 illustrated. The angle of the map is determined by either the magnetic deviation or the simple methodology of aligning it across the diagonals of the basic wind rose drawn on the vellum. 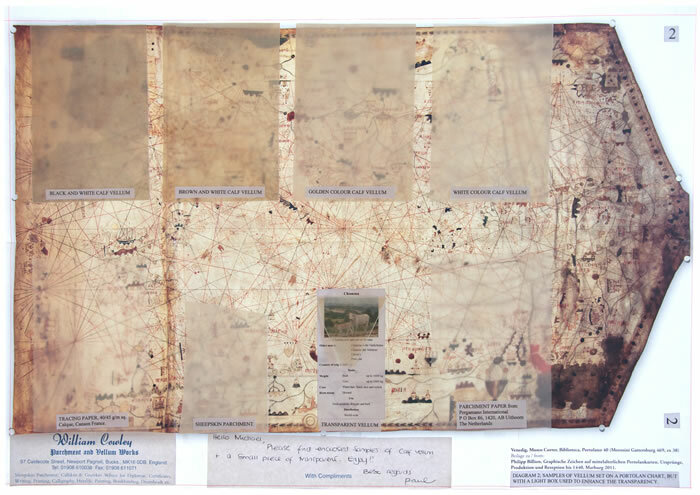 The template is then traced around the form of the littoral and the map is transferred. The second template shown on diagram ChPo3D9&D10 can be used to draw a basic chart and when combined with the first template all of the features are shown. This is shown on the actual chart as reference. At this stage the Portolan is ready to be completed. The place names can be appended and the map rotated on its board to enable each to be written perpendicularly to the coastline. The lines to form the finished wind rose can then be appended which enables the scribe to cautiously avoid obliterating text. Any decoration can also be added. 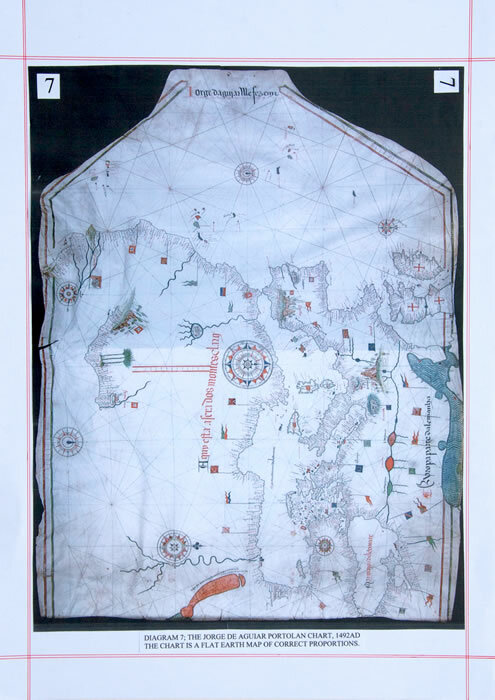 The finished work (the original Jorge de Aguiar Portolan) can then have the bordure added to ensure nothing of the map etc is obscured. The scale bar marks can be inserted as they appear to be random. This is a reference diagram only. The rectangular and square graticule is drawn beneath the Portolan for reference and shows the basic proportional grid which underlies the Portolan. The calculated measurements are appended illustrating how accurate the proportions 35/30/20/7 are and that they can be used with no discernible discrepancy upon the maps face. The scale bar set vertically in the central part of the Portolan appears to serve but one function, that of the measurement of the squares and rectangles that make up the base plot as diagram ChPo3D12 illustrated. But it is in fact divided into 14 subsections for the 7 unit ratio square. However once the map had been removed from the Portolan, it is a flat earth map [diagram ChPo3D11], the latitudinal measure noted there-on as 6 units for a 5 degree latitudinal section, is actually part of the whole system and can be measured using the scale bar. But it can only be measured if you have drawn onto the map the putative longitudinal and latitudinal lines by assuming that certain points are geographically correct, such as the 36N line. Thus it is fair to opine that the original map, as diagram ChPo3D11 illustrated, must have had these or similar graticule lines with the same measurements in a 6 to 5 ratio. But as each of the graticules is a 5 degree unit they can be reduced to a single degree for comparison purposes, as set out below. The latitudinal measure of the map is in fact the 4 Unit Ratio Square of the basic graticule plot on diagram ChPo3D17. It has in fact 8 subdivisions of the scale bar for the 5 degree division. Thus 1 part or 2 sections equals 150 stadia, with 1 section of 75 stadia. The length of the Mediterranean Sea is from the Pillars to Issus, 5.5W to 36E or 41.5 degrees of 5/6ths parts, that is 500 stadia per part and hence the length is 41.50 x 500 or 20750 stadia. Geographically the Mediterranean Sea is 41.50 x 488.65 stadia or 20279 stadia. 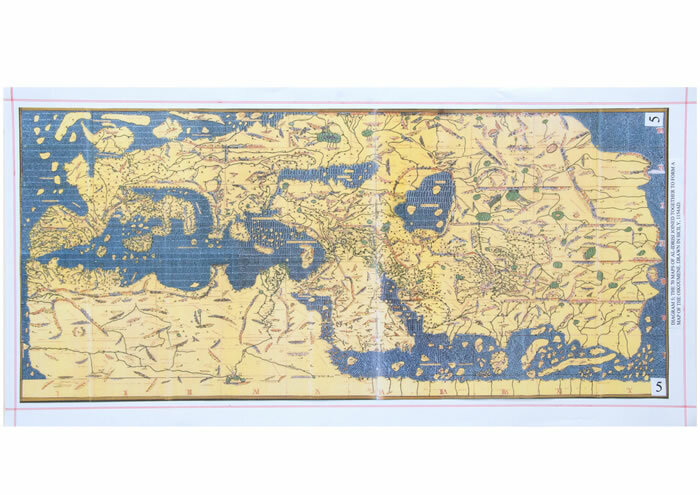 The original map is therefore of considerable accuracy, compiled no doubt from the Mediterranean Sea being sailed and measured for around 1000 years. CONCLUSIONS AND DISCUSSION: TOO MANY PORTOLANS! The Portolan is constructed with the simplest of techniques; that of drawing a graticule for the projection of the wind rose alignments and then using a template to trace or pounce the actual map onto the wind rose diagram. The angle chosen for the map setting down, be it magnetic or not, is then merely a matter of alignment across the graticule that has been drawn. Variation in size is only determined by the scale of the actual map section of the Portolan and this can be achieved quite simply by grid square transfer. Unfortunately with no reconciliation line for the two angles, geographic and magnetic, the mariners were left to sail a course using more than a little guesswork. This is no doubt how they were drawn, but why? If a simple line depicting the angle of actual chart magnetic north was to be drawn, it would resolve the problem, and not leave mariners to struggle with the two north points and thus deviations in sailing, even though there may have been three compasses on board. Why was it allowed to happen? Was it a design made by Monks in their scriptoria, having the latest information and not being sufficiently au fait with the ramifications of their design? When the ateliers copied the charts, did they actually know the magnetic deviations or were they just copying the Monastic originals? And, why did the mariners put up with it (there is doubt they were used) when it was obvious they had to place a “fly’ atop the pointer of the compass to create agreement? As usual, more questions than answers! “ G V active on Majorca for a period of at least 34 years (1433-1467), from which only 3 signed charts and a few anonymous ones (all decorated) attributable to the establishment have survived, had the capacity to produce over 24 navigational charts in 6 months. If we multiply this figure by 68 ( 34 years of two halves), we learn that if the atelier’s pace of production had remained constant throughout that time, over 1500 works of Portolan cartography would have issued from its doors”. This calculation has led to historians believing that there were thousands of Portolan’s in existence but not one appears to have survived. Thus from Vallseca’s work we have 3 possibly 5 out of the 1500 calculated as having been possibly extant after 34 years. But if the real Portolan was a “monastic’ map, highly decorated and copied by the ateliers, are we not looking at the sum total so carefully tabulated by R J Pujades i Bataller and numbering in the hundreds at most. There never were thousands! Let me explain. However, if we look at the whole tenor of the Protocol to understand how the document works there is another strand to consider. It is clear that any shortfall in the price of the maps sold still has to be made up by Vallseca to the full 70 pounds, while any surplus is to be returned to him. That makes sense, but the clause that prevents him from selling maps or charts to anyone else before fulfilling the 28 charts, ‘except if done to supply his basic needs and those of his family’, is intriguing. We must wonder how flexibly such a clause was interpreted and how many maps might be needed to generate basic subsistence. We must also consider the size of charts to be produced by Vallseca to sell for the correct amount. He clearly states, “navigation charts”, and these had little or no decoration. The size would determine the production rate, as would the complexity of the charts form. In fact one of the extant Vallseca charts does not even show the whole of the Iberian Peninsula. It is a pity that there is no further documentation to confirm if or when he actually cleared the debt. And, what is the chance that, rather than drawing new maps, he tried to acquire existing maps from others to make up the number needed, or to pass off inferior work. Finally, if Vallseca was in so much debt would he not work so very hard to produce the said charts, and no doubt work at a pace which is impossible to maintain for 34 years. Thus I completely reject the text and calculations in “Les Cartes Portolanes”. Yet another assumption which cannot be substantiated is that all of the so-called mariner’s sea charts were damaged and thus none survived. If there were so many thousands possibly produced, with this one atelier calculated as ‘producing’ 1500 for instance, and there are 47 ateliers noted on pages 486/487 by Pujades, the likelihood must be in favour of many more surviving if there were that many in the first instance. But were there that many, as one atelier appears to produce no more than one map a year. Thus it is necessary to rethink these ideas, and look to what exists, not what could exist. This text is an attempt to cut through the mire of mis-information and counter-arguments that the various schools of thought are peddling, and produce a coherent text which starts from first principles to produce a non-aligned definitive text which actually answers the questions. This has never before been attempted, no expert has ever tried to draw a Portolano and there are no copies available to test any theory. I have therefore chosen to start from first principles as my text illustrates. I trust someone will read this carefully and rethink the ideas! NOTE; the diagrams were drawn by the author and then photographed for continuity of presentation. The examples were cut out by the author, and the pinhole examples tested as is indicated on actual vellum. All drawing work is accurately to scale and thus the photographs can be enlarged for checking as they were taken using a professional digital camera. The following is the only clear text I have found which provides a short concise resume of what is known about and the Portolan charts we are discussing. I do not necessarily agree with the comments as my text indicates but it is a clear comparison and definitive statement. I include information of another text for comparison purposes in précis form. Jonathan T Lanman, The Hermon Dunlap Smith Center for the History of Cartography, Occasional Publication No 2, Chicago, The Newberry Library, 1987. Chapter 8; A proposal for the Origin of Portolan Charts. 1: THE DATA BASE. The primary source of data for drawing Portolan charts was the sailing directions in an early Italian ‘portolano’. The ability to draw charts from such data has been demonstrated, yielding charts comparable in accuracy to Portolan charts. One of those portolani, C de N (1296) is the oldest surviving Portolano, but is clearly a revision of an earlier work. The estimated mid-thirteenth century date for this predecessor makes it a likely candidate to serve as the primary source of data for the early Portolan charts. The charts would have depended mainly on the coastal courses which supplied sailing directions for perimeter navigation of the Mediterranean seas. The more accurate pelagic courses supplied by C de N might have been used to adjust the gross dimensions of the charts, but they could not have been used to draw a complete chart because of inadequate or absent coverage of various areas. 2: THE PROJECTION OF PORTOLAN CHARTS. Portolan charts were drawn on a square grid. A square grid is found among the loxodrome lines of the rhumb circles present on all Portolan charts. CP has additional square gridded areas lying outside its two rhumb circles. The Venetian chart cited by Laguarda Trias (1981) is completely covered by a grid of small squares and may be a more complete example of how the charts were drawn. On most Portolan charts, grids of small squares are not found. They could either have been erased or were omitted when a gridded master copy was pricked through onto vellum to make definitive and possibly multiple copies. 3: THE SKEWING OF PORTOLAN CHARTS. The skewing of Portolan charts was a reflection of magnetic declination. All Portolan charts prior to 1595 were skewed, as were two charts drawn from the sailing directions of the two Italian portolani. All accurately reflected contemporary magnetic declination. The skewing showed that charts were drawn from data collected with the use of an uncorrected magnetic compass. Declination remained relatively unchanged until the mid-sixteenth century, when a drift towards the west began. Portolan chartmakers were alert to the change, understood magnetic declination by that time, and beginning in 1610 drew charts to true bearings. 4: THE PURPOSE OF THE CHARTS. A major purpose of Portolan charts was to assist in sailing pelagic courses. Open-sea navigation became safer and more practical following the introduction of the magnetic compass. A chart for plotting pelagic courses was an essential adjunct, and was promptly met by the introduction of Portolan charts. Charts drawn from sailing directions would have shown coasts as sailing courses rather than shore lines. The conversion of sailing courses to shorelines would have required additional information. However, the shoreline details of Portolan charts were never accurately drawn. They were portrayed in a styalised manner, and the charts would have limited usefulness for inshore navigation and piloting. If this had been a major purpose of the charts, increasingly accurate shorelines could have been drawn over the three and one-half centuries of Portolan chart production. This was never done. 5: A DISTORTION COMMON TO C de N (SG) AND CP. The Italian peninsula showed an unusual and closely similar distortion in both the chart made from C de N, the oldest surviving Italian “Portolano”, and in CP, the oldest surviving Portolan chart. In C de N (SG), with the coastlines represented by sailing routes, the peninsula was too broad and had a squared appearance. This reflected in large measure the use of a long, straight, well offshore sailing route to represent a section of the east coast. The shape of the peninsula in CP was closely similar, but in this chart what had been an offshore sailing route appeared as the actual shoreline. Two such distinctive distortions could scarcely have arisen independently. Instead, the similarity suggests a common origin: the sailing directions in C de N.
6: CONTEMPORARY EVIDENCE. Unequivocal contemporary evidence that Portolan charts of the Mediterranean were drawn from sailing directions was found in a 1630 atlas by Joao Teixeria. It contained two charts of the Mediterranean. One was titled Levant por Derrotas (The Mediterranean by Sailing routes) and was skewed. The obvious and only known source of sailing routes defined by uncorrected compass bearings was the “portolani”. The other chart was titled Carta do Mar mediterraneo por Alturas (chart of the Mediterranean by latitudes) and was drawn to true compass directions. Similar paired examples were found dating back to the early sixteenth century, showing a clear contemporary awareness of the difference between the two kinds of charts. 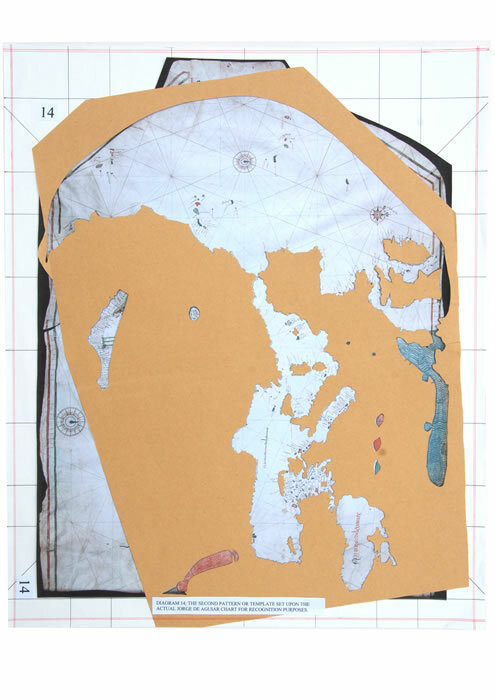 Several lines of investigation converged to support the proposal that the early Portolan charts were drawn primarily from data supplied by the early Italian “portolani”, which had proved on trial to be of sufficient accuracy to explain the remarkable accuracy of the early charts. The investigations also supported the proposal that the charts were drawn on a square grid, that their skewing reflected the “potolani’s” recording of bearings uncorrected for magnetic declination, and that both the skewing and the recorded bearings accurately reflected the contemporary magnetic declination in the Mediterranean. And, finally, the evidence suggested that a major, if not the major, purpose of the early Portolan charts was to permit the plotting of the long-distance, the pelagic sailing courses which had become safer and more practical with the introduction of the compass. Comment. I do not accept some of the findings as they do not address the actual beginnings of the portolan’s draughtsmanship, its construction and where the “accurate” map of the Mediterranean arose. That must be evident from my text which I consider the more likely. Philipp Billion in his 2011 text (Tectum Verlag Marburg, 2011) , page 332, section 5.6.3 The origin of Medieval Portolan charts, questions the base point of the Ligurian Coast as postulated by Pujades, and infers that there was an input from Mallorca and the North African oasis Sigimasa. Within the section 5.6.5, Billion makes the following point; A hydrographical analysis shows that simple unadorned charts and heavily ornamented charts do not differ in aspects of geographical exactness. Nautical utility and ornamental richness did not exclude each other. Thus I conclude that the base for all charts was a cut-out forma which was either a positive or negative and could be used time and again for the production of Portolan charts. I also conclude that it was a monastic invention, even though they may have had the use of the “portolani” texts. But did they require them having an excellent base map already to hand? Antonini Itinerarium, Parthey. Pinder & Moritz, eds. Itinerarium Antonini Augusti et Hierosolymitanum ( 1848, Berlin) now available on line. Billion Philipp, Graphisce Zeichen auf mittelalter lichen portolankarten. (Marburg: Tectum Verlag, 2011) p342. Gaetano Ferro. The Genoese Cartographic Tradition and Christopher Columbus, ( Roma, Instituto Poliografico E Zecca dello Stato. Libreria dello Stato, Roma 1996), pp 21-24, Innovations in Nautical Cartography. R J Pujades i Bataller, Les Cartes Portolanes, ( Barcelona, Institut Cartographic de Catalunya, 2007) p 416, The North Italian Peninsula. In La Carta de Gabriel De Vallseca de 1439, Pujades again makes this evident and Juan Ceva in his review of that book states,”Significant to this introduction is the statement that Portolan charts are an Italian invention and all charts produced in Majorca (and elsewhere) were copies based on a few models, like those of the 1300’s by Vesconte and Dulcetti(who settled in Majorca) as well as later works of their Genovese compatriots the Beccari family. This reveals that in the history of Portolan charts, there were a handful of true cartographers and numerous copy artists and miniaturist illustrators. W Cowley, Parchment & Vellum Works: Mk 16 ODB, England. Personal communications and explanations of manufacture, types, samples and advice concerning medieval texts and their base materials freely given. Heredotus, The Histories, A de Selincourt (trans) 1954. (Penguin Books Ltd, Harmondsworth 1954) see Book 5, chapter 58, p361. See also website text cgHs1. Pliny the Elder, Natural History. J Bostock (trans) ( London, Taylor Francis, 1855) See Book 13, chapters 21 to 23. See also website papers cgPl1 and cgPl2. The Lucca MS, Lucca, Biblioteca Capitolane Felisana, Codex 490, c800AD. Mappae Clavicula, a medieval text including recipes for a number of craft materials. Theophilus Presbyter, de Divers Artibus. A description of numerous craft processes by a Benedictine Monk. C R Dodwell, The various Arts: De Divers Artibus. (Oxford, Clarenden Press, 1961 and 1986). Strabo of Amaseia; The Geography of Strabo; ( Loeb Classical library, edition 1917. (H L JONES ed. Cambridge and Harvard, William Heinemann, 1917-1932) see also website texts Es/1 and Es/2 for details. Pirrus de Noha: Mappa mundi, 15th century, incipit by Pirrus de Noha of the De Cosmographia of Pomponius Mela. ( Biblioteca Apostolica Vaticana, Rome, Archivio di San Petro, H 31, fol 8r. Claudius Ptolemy; Stevenson E L, (19320 Geography of Claudius Ptolemy. (New York, New York Public Library, 1932, reprinted by Dover publications Inc. New York 1991. See web site texts, Cp1, Cp2, Cp3, Cp4, Ca1 and cgPt1. Paulus Orosius; Historiae adversum pagans libri VII, c415AD. (Christian Historical documents. ( https://sites.google.com/site/demontortoise2000/ translation) A T Fear; Orosius, seven books of history against the pagans. (Liverpool, Liverpool Univ Press, 2010) see also website text cgPa/01. Venerable Bede; Ecclesiastical History of the English People. Leo Sherley-Price (trans) (London, Penguin Books 1955) and Lives of the Abbots: Vita sanctorum abbatum monasterii, para 15, See website, Tp1 and Br2. J Kirtland Wright; Notes on the knowledge of Latitudes and Longitudes in the Middle Ages. (Chicago, ISIS, vol 5; 1, 1923) see pp 75-98. Al-Idrisi; Gegraphie D’Edrisi, traduite de l’Arabe en francais d’apres de manuscrits de la Bibliotheque du roi et accompagne de notes. P Amedee Jaubert. (Paris, Imprimerie par autorisation du Roi a l’imprimererie Royale, MDCCCXC. Bibliotheque nationale de france, departement des manuscits, division orientale: Cote ;Arabe 2221, Auteur totre, Idrisi, Nuzhat al-mustaq fi ihtiraq-al-afaq. Images 1-69 et planche contact 1-8. See also website texts, cgId1, cgId2, cgId3 and cgId4, which cover the text above with full explanations. Gwenyth Hood, trans, Book in Honor of Augustus (Liber ad Honorem Augusti), by Pietro da Eboli. ACMRS, Tempe, Arizona, 2012. Medieval and Renaissance Texts and Studies, Volume 398. H H Ricker III, has written extensively on the subject including Peter the Pilgrim and his Letter to be found on line. Contact details are email, kc3mx@yahoo.com. 1457 World map. The Genoese world map of 1457, facsimile and critical text incorporating in free translation the studies of Professor Theobald Fischer, with the additional copious notes by E L Stevenson PhD, issued under the joint auspices of the American Geog Soc and the Hisp Soc of America, 1912, New York. See also the Peregrination Website; http://peregrinations.kenyon.edu. The so called Genoese World Map of 1457: A Stepping Stone Towards Modern Geography? G Brunnlechner. The 1457 World Map; Genoese, Yes! Draughtsmanship before History. M J Ferrar, text cg1457 on website. J Alves Gaspar; Dead reckoning and magnetic declination; unveiling the mystery of Portolan Charts. (e-Perimetron, vol 3, No4, 2008, (191-203). The Jorge de Aguiar chart of 1492 and the 1339 chart of Angelino Dulcert are discussed here-in. Les Cartes Portolanes is a Spanish text with an English section but this is not a full translation of the original. Hence on pages 273 to 275 Pujades explains more fully the whole protocol, but does not change his text regarding the possibility of some 1500 charts being produced over 34 years. This I totally dismiss. The works of Vallseca are, 1) 1439 a chart showing Atlantic to Black Sea, highly ornamented. 2)1440, undated and unsigned west Med Sea chart. 3) 1447, Med Sea only. 4) 1447, anon? undated unsigned fragments of Portolan chart covering east Med Sea only. 5) 1449, Med Sea only. Thus the 28/24 charts could be small localised as these illustrate. In his review of Pujades text, La Carta de Gabriel De Vallseca de 1439, Juan Ceva states the following,” Five works of Gabriel de Vallseca have survived to our time (three signed and two attributed). It is sobering to consider how little has survived if one considers Pujades statement that his atelier probably saw nearly 2000 works produced. This statement is based on a fascinating document in which Vallseca agrees to settle a debt by providing the debtor with 28 charts, four immediately, and the rest over six months. This yield of one chart per week gives us the remarkable number of charts over the 38 (sic) years of activity in this area. Most of the charts would have been of a utilitarian nature used by seamen and merchants and would lack the decoration and miniatures, flags and legends that we see in the luxurious models intended for rich clients like the 1439 chart which occupies us.